One of our readers, Gareth Webber, pointed out a strange looking aircraft stored at AMARG, the Pentagon’s aircraft boneyard in Tucson, AZ. I immediately noticed it from an article that ran a year and a half ago in Aviation Week about a stealthy F/A-18 Hornet concept that was photographed sitting along the AMARG fence-line. The article’s analysis was spot on given the limited visual information available, but new satellite photos may tell a very different story. The article, which is still available to Aviationweek.com subscribers, pictured what looked like a stock Super Hornet rear fuselage, with standard tails, possibly with low-observable coatings on their leading edges and quadrilateral air intakes, along with the Super Hornet’s long leading edge root extensions (LERXs). The specimen’s exhaust nozzles were clearly serrated in a similar way as the F-35’s are today and were plugged with cone shaped covers. It also looked as if a modified “barrel section,” the hump that runs along the Hornet’s spine, was grafted on midway with a large serrated seam. Other serrated seams and panels, indicative of low observable designs, are seen on the aircraft featured in that article as well. From the angle of the photo, the aircraft looked like it was missing its nose section from about where the rear of the canopy would begin on an F/A-18E. Bill Sweetman, Aviation Week’s renowned senior reporter on such matters, noted that the aircraft appeared to be lacking wings and a forward fuselage. He also reported contacts at Boeing said that the modifications featured on the strange fuselage never flew on a demonstrator and that it was not part of the Super Hornet Advanced program. It seemed that this was part of some sort of entirely separate effort to lower the Super Hornet’s radar cross section. The Aviation Week piece had a few other details and further analysis, but that was the gist of it. In the end it appeared to be half a stealthy Super Hornet mock-up, possibly built for radar cross-section evaluations. This seemed fairly benign as testing small changes to an aircraft’s components to see if they reduce radar reflectivity is a normal part of fourth generation fighter evolution these days. Also, the Super Hornet already features some low-observable characteristics, including radar blocking baffles over its engine faces, S-shaped air ducts and edge alignment in certain places. Making it more stealthy has been an ongoing project for Boeing in an effort to compete with the F-35 Joint Strike Fighter. There’s one issue with this analysis though, in satellite photos the specimen in question appears to indeed have a nose, one that is so exotic it may have looked like it didn’t even exist from a reward angle of the “through the fence” shot that was originally evaluated by Aviation Week. 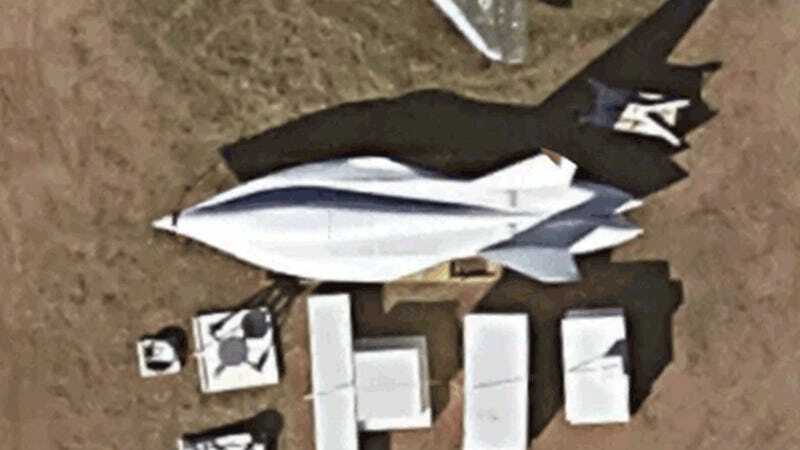 From multiple satellite photos, it appears that this test aircraft had a different forward fuselage grafted onto it and may be complete minus wings and horizontal tail surfaces. This strange configuration seems have Hornet’s LERXs joined to create a horizontal chine-line coming to a flowing point at the front of the aircraft. In essence, the front of this Hornet seems much more X-47B or B-2 than F/A-18. There is no traditional “barrel and cone” like Hornet nose at all, and thus no traditional radar nosecone fairing, and seemingly no cockpit. Could this have been Boeing and the Navy’s attempt at creating a Super Hornet derived Unmanned Combat Air Vehicle? One that had a drastically lower cross-section than any Hornet concept we have seen before? If a cockpit was to be integrated into this design as it appears via satellite, it would have to be set well farther back than in the standard Super Hornet, at or even further behind where the second cockpit begins on the F/A-18F. Such a design choice would not only look very strange, it may interfere with the position of existing systems in the Super Hornet design, although it would hide the canopy from from radars emitting towards the jet’s lower hemisphere. Overall, it seems somewhat unlikely, but still possible, that this specimen, if it is indeed as exotic as the satellite images seem to show it to be, was modeled as a manned design. If this was the case, the reality remains the same, this would be a drastically different, far more aggressive stealthy Super Hornet concept than anything we have seen before, also a much shorter one. Also worth noting is that the fence-line photo of the unwrapped aircraft featured in the Aviation Week report appears to clearly omit any sort of cockpit or structure where a canopy rail would connect with the upper fuselage, although the angle of the photo remains less than ideal for a highly accurate evaluation regarding its existence. The most puzzling question about this strange Franken-Hornet concerns its wings. If the idea was to design a very low signature Super Hornet derivative, manned or unmanned, with the Super Hornet’s many missions in mind, standard wings may have been envisioned. If this design was to be more focused on providing information, surveillance and reconnaissance, it is possible more exotic composite wings, potentially of more slender chord and incorporating a higher degree of laminar flow, could have been part of the concept. This could have led to enhanced low observable qualities and could have provided better high-altitude and loitering performance. The idea of using an unmanned stealthy Super Hornet working mainly as an information, surveillance and reconnaissance node makes a lot of sense, especially considering the aircraft has no internal weapons bays to keep its radar signature low while carrying stores, although a large ventral stealthy weapons and sensor canoe, as seen on the Super Hornet Advanced, could have largely solved this issue. In the end, the concept’s intended wing design remains a mystery, if it even got that far in the first place. Although, knowing more about them would tell a much more clearer story about this unique airframe. The mystery of AMARG’s stealthy test Hornet has only deepened with the possibility that it indeed could have a nose section, and a highly exotic and potentially very low observable one at that. Considering the Navy’s long saga of trying to field some sort of unmanned aircraft capability for its carriers, having commonality with a stealthy unmanned Super Hornet design makes quite a bit of sense, both when it comes to avoiding developmental risk and keeping costs as low as possible. We cannot underline enough that there remains a clear possibility that its exotic looks from above could be a trick of the camera or some missed variable, such as the possibility that front radar cross section testing was not part of the program. Then again, considering the clear low observability goals of the project and the strange lack of a traditional nose section, with a seemingly purpose-built frontal section with a serrated seam applied in its place, the evidence seems to point in another direction. Although the unique aircraft concept in question may have been a dead-end in aviation history, it remains more intriguing than ever, and sometimes those dead ends are more fascinating than the ideas that continue on.